Scala is an amazing language that has propelled the JVM into the functional world. It's the language that created Spark, Kafka, Akka, Samza, Play, and Finagle, and its conciseness, expressiveness, and a vast list of operations have made it one of the preferred languages in big data and messaging. Daniel Hinojosa leads a fast-paced look at Scala, helping you hit the ground running with the language. Daniel covers key concepts, such as manipulating variables and string formatting, before jumping into objects, classes, and functions. Within the first 30 minutes, you’ll create a script and a runnable application. You'll leave with a firm understanding of Scala basics, preparing you for deeper dives into the language. You're interested in learning Scala and want exposure to fundamental concepts and a roadmap for further learning. You currently develop in another functional language and are interested in how Scala handles similar constructs. You want to know if Scala is something that will work for your team’s next project. 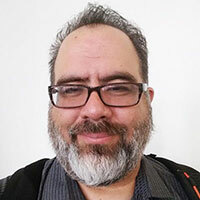 Daniel Hinojosa is an instructor, speaker, recent author, programmer, and consultant with over 20 years of experience working with private, educational, and government institutions. He is also currently a speaker on the No Fluff Just Stuff tour. Daniel loves JVM languages like Java, Groovy, and Scala, but he also dabbles with non-JVM languages like Haskell, Ruby, Python, Lisp, C, and C++. He is an avid Pomodoro Technique practitioner and attempts to learn a new programming language every year. Daniel is the author of Testing in Scala and the video Beginning Scala Programming as well as the teacher of a line of training courses, all for O’Reilly. In his downtime, he enjoys reading, swimming, playing with Legos, and cooking.